Lion Lamb Blog -- David Mundy: Crucifixion? I am tempted to say that the biggest "name" at the Epiphany Explorations conference was the biggest bust, but that would be overstated and unfair. 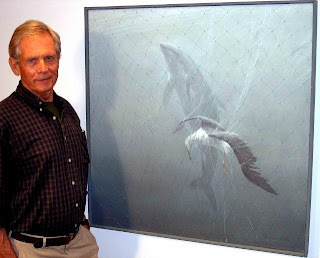 Still, I was somewhat disappointed by the two hour presentation by celebrated Canadian painter, Robert Bateman. This product of a United Church Sunday School in Toronto had a number of important things to say about caring for creation. But he simply didn't use his own body of work sufficiently to illustrate his passion for the Earth. As a speaker he is a good painter! He did use the projection screens to share with us what he has apparently termed his most important work, a haunting image of a dolphin and an albatross caught and drowned in a drift net. For this painting he procured a piece of drift net and applied it over the painted images. He pointed out that an estimated one million mammals and one million sea birds perish in these nets each year, not to mention the countless tons of fish "bycatch," those species which become entangled in the nets but are tossed back into the sea, dead, because they have no commercial value. He said that he didn't want to offend us, but for him this was a crucifixion scene, God's creatures sacrificed by uncaring humans. I found this to be the most profound and moving moment in his presentation. Are you comfortable with his use of the term crucifixion? Should we feel sorrow for dead birds, and dolphins and fish, the way we feel sorrow for those who have died in Haiti? Do you still think it is possible to change our destructive ways for the well-being of planet Earth? I'd say the term was misapplied in this case, although there is an obvious connection between the idea and what he's trying to do with it. With respect to environmentalism, I am concerned that once both media and public attention tire of the issues, they will be tossed on the back burner. Despite it being so apparent that humankind is changing the planet for the worse by its actions, governments in North America especially have been slow to act. The present Canadian government's token treatment of our contribution to global warming is especially maddening. Why is it we place more value on the comings and goings of celebrities than we do with preserving our only home in the face of its gradual destruction? Sometimes I just don't 'get' people. I am not uncomfortable with Bateman's use of Cruxification. It is very thought provoking and raises many questions for me. How do I care for the non-humanoid species (I'm a big Star Trek fan)of the world that I'm a part of? How do I proceed to make sure that all can survive,have a livable environment, and are treated fairly and justly? I have far more questions than answers but I do know that we do need to change the way we view the world and how we live in it and with each other (humanoid and non-humanoid). Different reactions to the use of the word crucifixion but agreement that our disregard for the wellbeing and balance of the Earth's creatures is a crime. Thanks. I'm conflicted with whether the use of the word crucifixion was appropriate and yet the thought did provoke a gut reaction in me, a feeling of grief. I do believe that creation is being tortured and treated unjustly. There is suffering in both instances. Creation I see as innocent and voiceless. Jesus, although poor and with little power compared to the Roman Empire, was not innocent. He knew his words would bring trouble from those in power. It is definitely a thought-provoking sentiment.